Gladiators were divided into different classes according to their weapons and fighting styles. There were strict rules and protocol surrounding the fights of gladiators. A gladiatorial fight would usually involve two gladiators but different types of gladiators such as the Paegniarius, would only fight animals. What type of gladiator was a Paegniarius? What was their purpose? What was their style of combat? And what type of gladiator was matched as their opponent? - Weapons: The Paegniarius, as shown in the mosaic, used a whip, which was similar to a modern day bullwhip. A bullwhip is a single-tailed whip, usually made of braided leather. - Body Armor and helmet worn by this type of gladiator: The Paegniarius wore no helmet and used protective leg padding called Fascia. These wrappings were made of cloth or leather and covered his legs from the knee down. Wraps were also used around the feet. He also wore a protective wide leather belt called a Cingulum worn to protect the gladiators waistline from being injured. 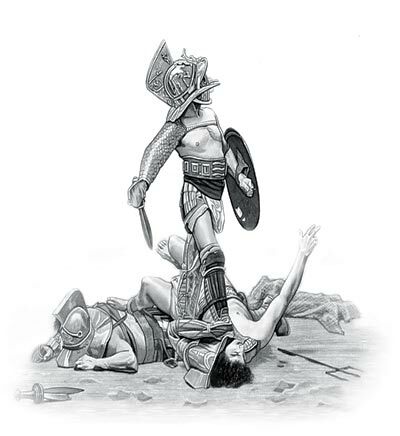 The content of this Paegniarius category on the different types of gladiator who fought to the death in the gladiatorial combats staged in Ancient Rome provides free educational details, facts and information for reference and research for schools, colleges and homework. Refer to the Colosseum Sitemap for a comprehensive search on interesting different categories containing the history, facts and information about Ancient Rome. Interesting facts and information on this type of gladiator: their weapons, their armor and their style of combat.